We love homegrown carrots, and since I started using Enviromesh they have become a regular crop on my plot. Without the mesh they would not be worth the effort, because they would inevitably fall prey to the Carrot Root Fly. Carrots can be sown over a long period [Feb to Jul], especially if sown successionally (in little batches, at different times), but I usually sow mine all at once, in mid to late March and aim for an extended harvest by sowing several different varieties. This year I have chosen "Nantes" for early cropping, and "Autumn King" and "James Scarlet Intermediate" for maincrop, and I also have a few "Dragon Purple" that I got from a seed-swap. At a later date I will also sow some "Amsterdam 3 Forcing" for baby salad carrots. The first thing to do is prepare the ground. I am using a raised bed which is 1 metre wide, 2.4metres long and 40cm deep. It is filled with a soil-and-compost mix, and is virtually stone-free. I dug it with a fork and then raked it to a fine tilth. I specifically avoided manuring this bed, because manure can (allegedly) cause carrots to fork or spilt. My next stage is to make a number of shallow drills (grooves) in the soil, about one inch deep. I do this by pressing the handle of a rake into the surface of the soil. (Luckily, my rake has a detachable head). My drills are very roughly 15cm / 6 inches apart, which is probably closer than ideal, but I always try to squeeze as much as possible out of my limited space. I then use a watering-can with the rose removed to carefully wet the surface of the drills, whilst keeping the surrounding soil dry. Then I manually sow the seed along the drills a "pinch" at a time, using thumb and forefinger, trying to sow them as evenly as possible. Again, the ones in my photo below are probably too close, and if they all germinate they will need to be thinned. I like to err on the generous side, because I don't want gaps in the rows because my space is very limited. I label each row so that I remember which is which. Once the drills are fully populated the next stage is to cover the seeds with dry soil. For this task I use a little metal tool called a "Widger". It's a very handy little item that has lots of uses in the garden. Then, tamp down the soil using the back of a rake with the handle held vertically. This will ensure that the seeds are firmly in contact with the moist soil in the drills. The final task for me is to erect a suitable frame and cover it with Enviromesh or similar. Here I'm using the very effective and versatile "Build-a-Ball" system, with aluminium rods purchased from Gardening Naturally. So, there you are then. That's my method. Hopefully by about the end of June I'll have some lovely crunchy carrots to harvest! 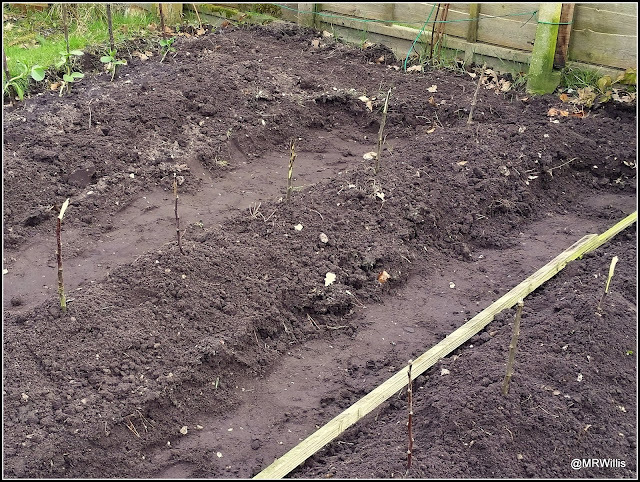 Let's be honest, with plenty of space to play with, they didn't need to be ultra-neat, like the raised beds I'm used to in my own garden! The soil here is very light and sandy, so it only took me a few minutes to build the ridges. 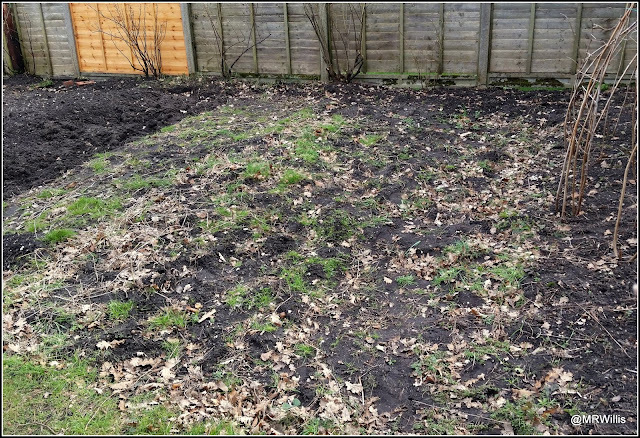 It was satisfying to see that although this patch of the plot is the first bit that I dug, very few weeds had grown back. I must have cleared them pretty thoroughly. There were still a few bits of Couch Grass though, so I'll have to watch out for that. Once the ridges were made I placed some short sticks to indicate where I was going to put the seed tubers. They were roughly 50cm apart. Then I just used a trowel to make a hole about 15cm deep, adjacent to each stick, and placed the seed tuber in it "Rose end" (the bit with most of the shoots) uppermost, and backfilled. I made a small mound of soil over each potato. On this occasion I planted 3 varieties - "Foremost", "Sarpo Una" and "Jazzy" - one First Early and two Second Earlies. In a couple of weeks' time I'll be planting some Maincrops too. As I was admiring my handiwork today I realised that even when I have completed the three rows of potatoes, I will have used only about a quarter of the plot, leaving me plenty of space for other crops. 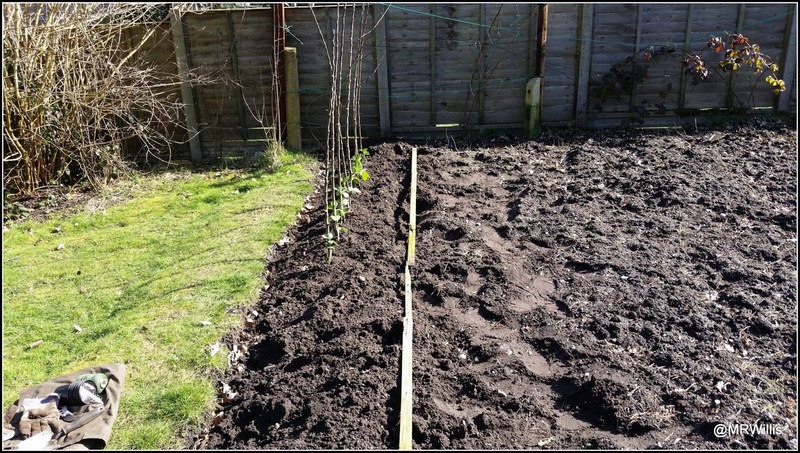 The Broad Beans and two rows of potatoes can be seen right down at the far end. Raspberry canes just visible at extreme Right of photo. Blackcurrant bushes alongside the fence. 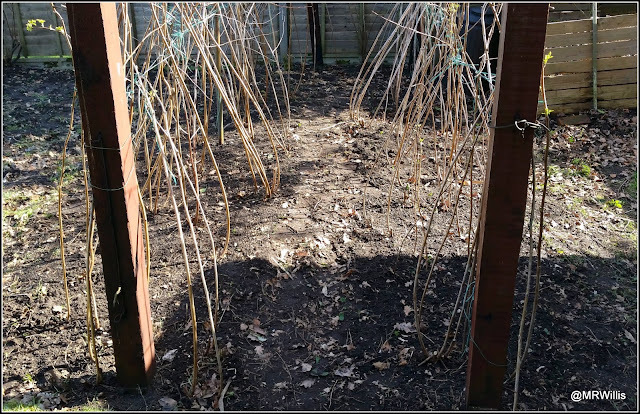 Since the potato planting took less time than I had expected, I had an opportunity to start on mulching the Raspberry canes. 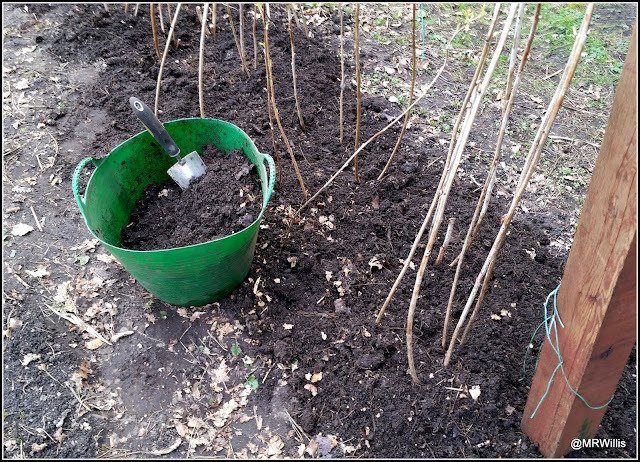 Fortunately the compost heap is very close to the Raspberry patch, but even so it was hard work digging out and distributing about 10 trug-tub-loads of compost! I only managed to do one of the two rows of canes before I got tired. The other row will have to wait till next time. 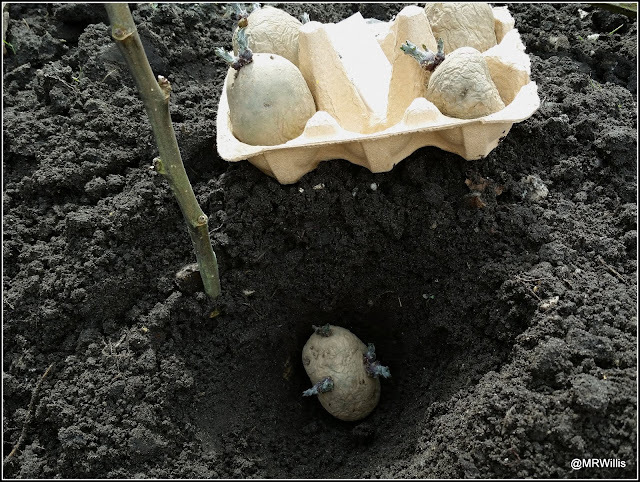 Unsurprisingly, Second Early potatoes mature a bit later than First Early ones! Typically they take about 13 weeks from planting to harvest, whilst First Earlies take about 10. I usually plant the Second Earlies a couple of weeks after the First Earlies, so that they will be ready about a month later. This year I am only growing two Second Early types - the superb and well-known "Charlotte" and a rather similar but less well-known variety called "Nicola". The latter is sometimes described as an Early Maincrop, and is ready for harvesting just that bit later, which is useful when you want to extend the harvesting period. The Seedling Greenhouses are placed just next to the three upright 2-Tier Mini Greenhouses which are hosting my "Foremost" First Early potatoes. The other pots you see at the left of the photo above are waiting for tomatoes. They are going to have a long wait because I have decided not to sow any tomatoes until after we return from a holiday next month, so it will be late April by the time they go in. I'm acutely conscious that young tomato plants demand a lot of careful attention, and I don't want to impose this upon any of my regular Garden Helpers. As it happens, having to sow late will probably be a blessing in disguise, because I find that early-sown tomato plants often struggle with cold weather and poor light. March has been a particularly poor month in this respect, so let's just hope that April is better. These are ones I rescued from the Courtmoor Avenue plot late last year. I have no idea what variety they are, and having been harvested far too late in the year they are not good specimens, but several of them are showing signs of growth now - the most obvious being the green leaves. I planted 45 Shallots, but to be honest, I'll be happy if 15 of them grow. Just as long as I can bring a few to maturity, allowing me to provide that genetic continuity that I'm striving for. 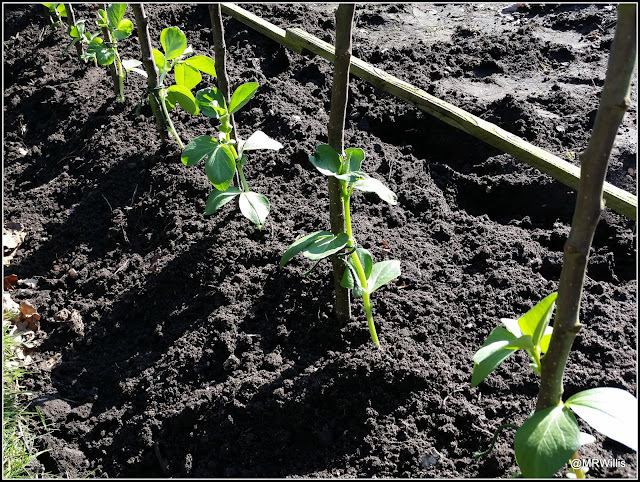 I thought potatoes would probably be the first things to be planted at my new plot, but I was wrong - it was Broad Beans. 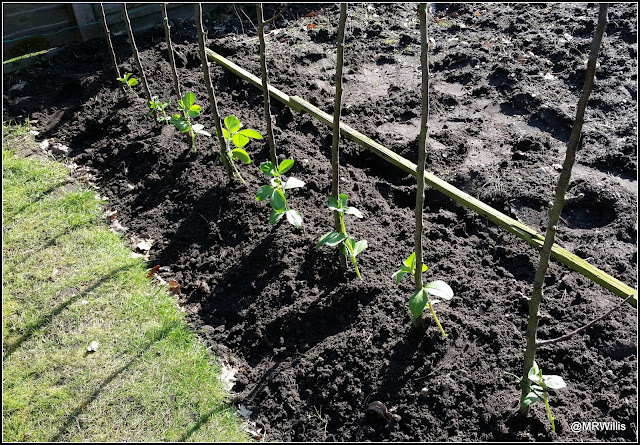 Having assessed that the spare plants I had were not going to be needed in my own garden, I decided to take them up to the Courtmoor plot and put them in there. It was a small gesture (only 8 plants), but it was a significant moment for me! 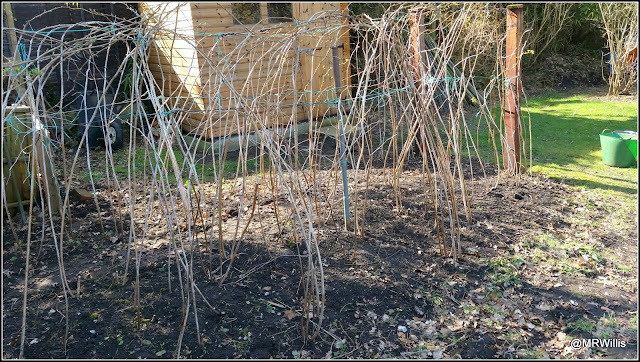 I used some of the prunings from the Apple trees as stakes for the beans, and tied them in loosely with some soft string. The sticks are about 4 feet tall. I have been trying to envisage what the plot will look like when it is fully populated, and today I used a couple of pieces of wood to help me work out how many rows I'll be able to have. My next job is going to be planting potatoes (honest! ), so some more spadework will be required. 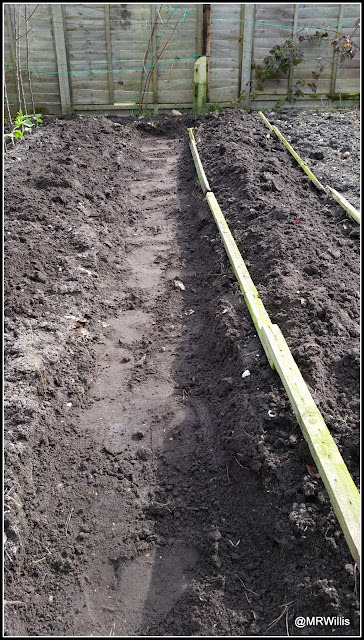 I'm going to make three low ridges for the potatoes, with "gullies" in between, up which I will be able to walk. The chits look really good - short, dark and strong-looking. When I get the opportunity I am going to put down a mulch of partially-rotted compost along the rows of canes. This will hopefully help to suppress the weeds and keep the roots of the canes cool. Here they are, shortly after planting out, protected by netting against animals. When I heard about the imminent severe weather, I covered them with my long cloches. Although Broad Beans will stand a few degrees of frost, I was afraid that they might be broken by heavy snow accumulating on top of them. I was right to be worried. We had our heaviest fall of snow for several years. This photo was taken when the thaw had already begun. Well, it seems the cloches did their job pretty well. The beans are fine. No sign of any damage. Meanwhile, the little Brassica and Allium seedlings have also survived all right, protected as they were by the big Gabriel Ash coldframe. One of the few crops I am currently harvesting is the Purple Sprouting Broccoli. The first variety to be ready was "Rudolph". This year I decided to be unconventional and not cut the tip of the plant first. Doing that is supposed to stimulate the production of spears lower down the plant. This one doesn't seem to need much stimulation. I have already picked 15 really nice big spears from it, and there are plenty more to come. The things we call "spears" are the flower shoots of the plant, and they grow in the leaf axils (i.e. between the leaves and the main stalk), just like Brussels Sprouts. In this next photo you can see where some have been harvested. 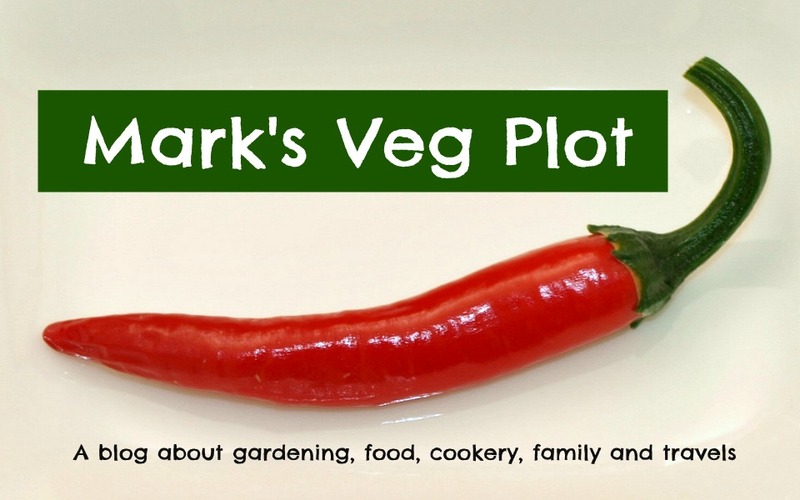 Many readers will know that I am growing four PSB plants, one of each of four different varieties, with the intention of having a longer harvesting period. L to R: Early Purple, Red Spear, Red Arrow, Rudolph. Though not quite as big as "Rudolph" (which is about 4 feet tall), "Red Spear" is a big plant, and will yield a good number of spears. "Red Arrow" is a bit less well advanced, and will not be ready for about 3 or 4 weeks yet. And ironically "Early Purple Sprouting" will be last of the four! 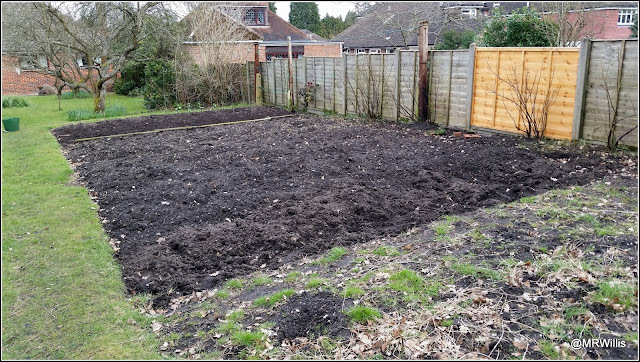 Hopefully within a few days I will be able to report my first planting up at the Courtmoor plot, which is scheduled to be potatoes (and possibly a few of the spare Broad Beans). You might recall that about a month ago I sowed seeds of 20 different varieties of chilli. They germinated at different rates, keeping me guessing (and checking the propagators in the airing-cupboard at least twice a day). Well, 16 of the 20 varieties have germinated now. I think it is unlikely, though possible, that the others will eventually show up. I certainly haven't given up on them yet. However, I did sow "one or two" more varieties, just to make up for the No-Shows. I think you can probably understand why I am not really surprised that those ones have not germinated! As you can see from my photographs, the chilli plants are still small, but they look very healthy. I haven't yet had too much of a problem with aphids (tough wood!). The ones seen in the photos above were transplanted into individual 9cm pots about a week ago. 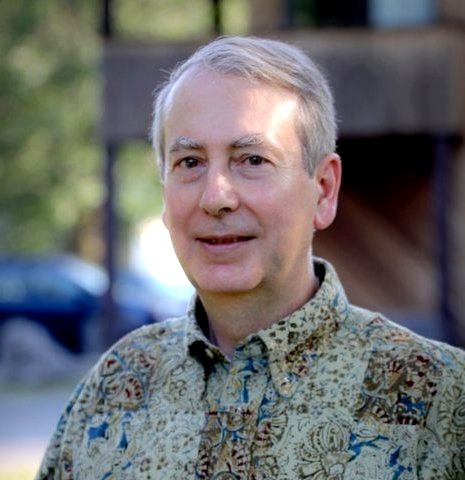 Even when all the seeds I had sown germinated, I kept only the two strongest-looking seedlings of each type, and my intention is to give away one, so that I'm only left with one to grow on to maturity. This selection will probably be made some time around the end of April. The potted-up plants have been doing the usual "Indoors-Outdoors" dance, being taken out to spend a few hours each day in the coldframe whenever the weather has allowed, and brought inside for the nights. In my opinion it is a good idea to toughen-up the plants as soon as possible, and as long as they get good (natural) light they will tolerate slightly lower temperatures. Last week the temperature in my big coldframe was mostly somewhere between 14 and 16C during the day, and on one occasion reached 20C. The later arrivals are a lot smaller and still being nursed in the Growlight House. I think most of those will be ready for potting-on into individual pots in about another week or so. Meanwhile, the over-wintered ones are still hanging on - the ones that had the benefit of the self-watering system, that it. The others didn't make it. You can see the snow covering my garden in the background of this photo. I have started giving the over-wintered plants a weak feed of tomato fertiliser ("Tomorite") every few days now, so I'm hoping they will buck up and produce some new growth. At present I would say they are just surviving, not thriving. Still, if I can keep them going for just a few more weeks, until the weather warms up, I think they will be OK. The aftermath of "The Beast From The East"